June 10, 2013 was the 50th anniversary for the Equal Pay Act. 29 USC §206(d). Despite the media hype about wives making more than their husbands, 50 years after its passage, there continues to be a very significant wage gap between men and women in the same jobs. The Institute for Women’s Policy Research (the “IWPR”) , tracks the wage gap every year and publishes annual updated fact sheets. For 2012, the IPWR found the wage gap actually got wider from the previous year as women’s median weekly pay rate declined from 82.0 percent of men’s in 2011 to only 80.9 of men’s median weekly pay in 2012. http://www.iwpr.org/publications/pubs/the-gender-wage-gap-2012 While women: 1) make up nearly half of the workforce, 2) are the equal or main breadwinner in 4 out of 10 families and 3) have more college and graduate degrees than men, on average they earn only 77 cents for every dollar men earn. This is a 23 cents wage gap which amounts to billions of dollars every year and hundreds of thousands, if not millions of dollars less pay over the earning life of an individual woman worker. At the recent Equal Rights Advocates fundraiser luncheon on June 13, 2013 in San Francisco, guests were shown a dramatic movie short documenting the enormous loss of income unequal pay represents over the life of several young girls and what they could buy with all that lost income. The Real Cost of the Wage Gap. The IWPR found a wage gap in virtually every occupation where earnings data is available to compare men’s and women’s earnings. It concluded that at the current rate of slow increase in women’s pay, it will take almost another 50 years–until 2057 to reach pay equity for women. Women of color are even worse off: on average they earn only 62 cents for every dollar a man earns doing the same job. The Real Cost of the Wage Gap. Equal Rights Advocates Annual Fundraiser Luncheon: June 13, 2013 Last Thursday, June 13, 2013 the San Francisco sky was cloudless, almost painfully brilliant-blue. For the sixth year in a row, I volunteered to help at the annual fundraiser for Equal Rights Advocates, the public interest law firm dedicated to reversing gender inequality via targeted, high impact lawsuits. The event was emceed by local award winning news journalist Rita Williams. It is always so inspiring to mingle with the hundreds of men and women who attend and sponsor this event, mostly my fellow lawyers– who share a common interest in eliminating gender inequality in the workplace, school, healthcare, politics and military services. Did I leave something out? The theme this year was “Close the Wage Gap”, referring to the wage gap between men and women which unfortunately still exists — despite the passage of the Equal Pay Act, 29 USC §206(d), 50 years ago in 1963. This federal law requires employers pay their women workers the same as their male workers for doing substantially similar work in similar working conditions. Equal Rights Advocates has a Facebook page where working and wannabe working people can submit a self photo holding a sign highlighting the wage gap in their chosen occupation. At the ERA luncheon, a professional photographer shot willing guests for inclusion on ERA’s Facebook page. 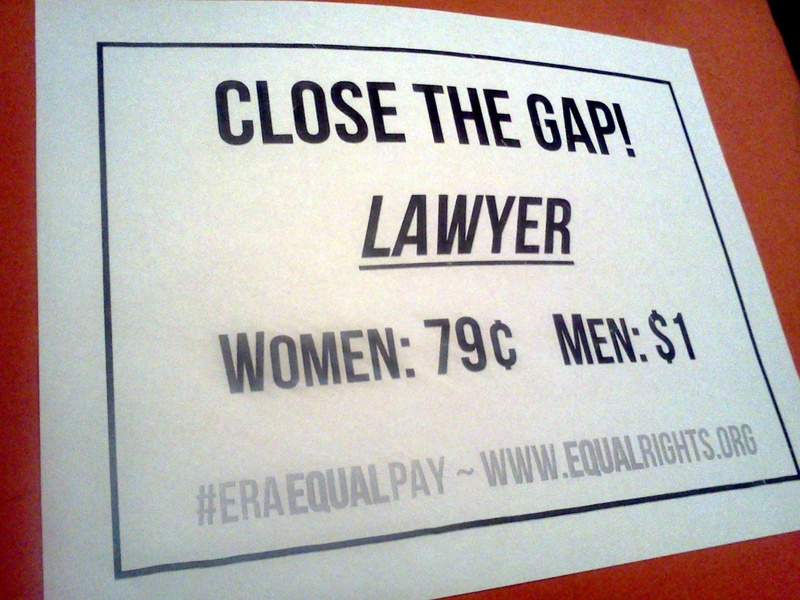 My lawyer signs reads: Lawyer: Women: .79 Men: $1. ERA’s executive director, Noreen Farrell posted a blog forcefully advocating an end to the wage gap on the Huffington Post. The Startling Facts about the Gender Wage Gap Despite the media hype about wives making more than their husbands, 50 years after the Equal Pay Act was passed, there continues to be a very significant wage gap between men and women in the same jobs. The Institute for Women’s Policy Research (the “IWPR”) , tracks the wage gap every year and publishes annual updated fact sheets. For 2012, the IPWR found the wage gap actually got wider from the previous year as women’s median weekly pay rate declined from 82.0 percent of men’s in 2011 to only 80.9 of men’s median weekly pay in 2012. http://www.iwpr.org/publications/pubs/the-gender-wage-gap-2012 While women: 1) make up nearly half of the workforce, 2) are the equal or main breadwinner in 4 out of 10 families and 3) have more college and graduate degrees than men, on average they earn only 77 cents for every dollar men earn. This is a 23 cents wage gap which amounts to billions of dollars every year and hundreds of thousands, if not millions of dollars less pay over the earning life of an individual woman worker. At the ERA fundraiser luncheon, guests were shown a dramatic movie short documenting the enormous loss of income unequal pay represents over the life of several young girls and what they could buy with all that lost income. The Real Cost of the Wage Gap. The IWPR found a wage gap in virtually every occupation where earnings data is available to compare men’s and women’s earnings. http://www.iwpr.org/publications/pubs/the-gender-wage-gap-by-occupation-2 It concluded that at the current rate of slow increase in women’s pay, it will take almost another 50 years–until 2057 to reach pay equity for women. 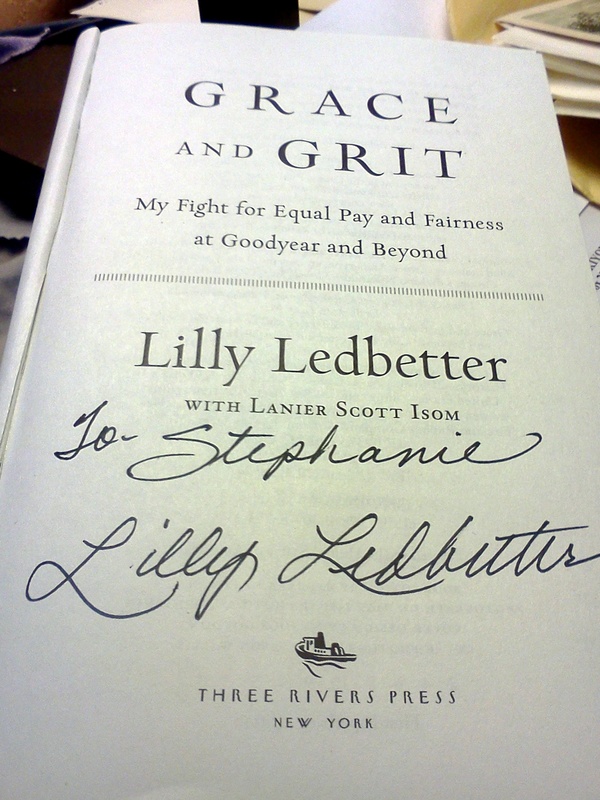 It was too late to help Lilly, but her efforts will help thousands, if not millions of women workers who seek pay equity. 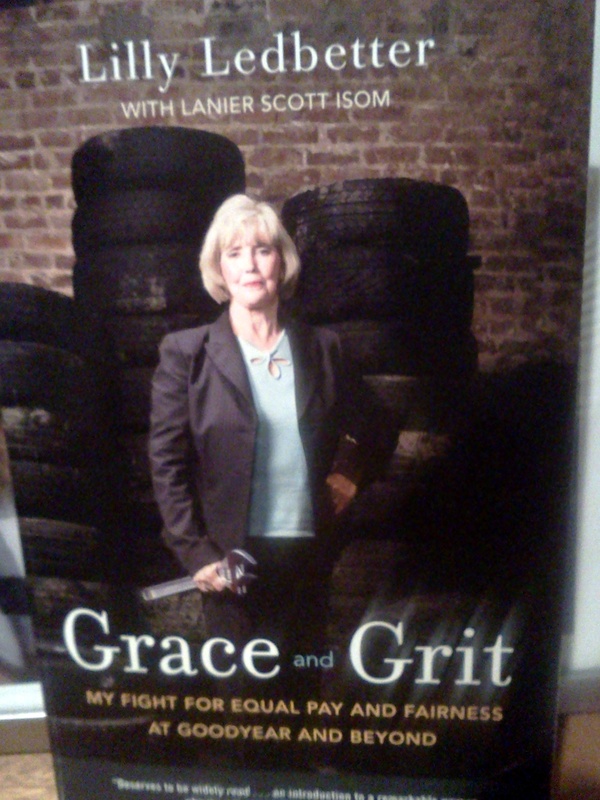 On the BART ride back to my office in Martinez, I started reading Grace and Grit, which chronicles her fight for equal pay and fairness. It is a compelling read. Her persistence and courage make her a great role model for my daughter–and me! The preceding is for educational purposes only and does not constitute legal advice or create an attorney-client relationship between the author and any reader. Marjorie A. Wallace is licensed to practice law only in California. Such acts in most cases should violate Section 7 of the National Labor Relations Act (NLRA). See discussion in my April 2013 post on proposed caregiver responsibility or “familial responsibility” legislation in California.